“The building used to be a tomato factory. This space was where the trucks would pull up to unload the produce,” Ralph Bland said as he gestured around the large, airy room that is now the cafetorium — the combined cafeteria-auditorium — of Detroit Edison Public Academy School, a PK-12 public charter school in Detroit, Mich. Bland is DEPSA’s superintendent. This campus he leads consists of one building for pre-K through eighth grade, a separate building for the high school, and a community garden. It’s picture day. Elementary school students wearing uniforms file by. The kids wave to Bland or reach out to shake his hand. This type of thoughtful design permeates the entire school. The environment is deliberately crafted to encourage excellence through structure and rigor. It’s a warm place, but it’s also an environment designed to promote scholarship. Bland understands that kids don’t innately value structure; it’s something they must learn to appreciate. Each student begins DEPSA by attending a two-week “Character Camp” that focuses on culture-building and norm-setting. It’s also a time for DEPSA to orient students to the school’s philosophy: high school graduation is not the goal. It’s a stop on the path towards excellence: college graduation. Her classmate Dae’von is a case in point. He came to DEPSA from another public charter school because his mom felt he wasn’t being challenged. Dae’von embraced the struggle. He’s on track to receive the International Baccalaureate Diploma Programme diploma, and he even attended a summer program at Harvard University in Cambridge, Mass. DEPSA’s student body is 100 percent black, and 65 percent receive free or reduced-price lunch, an indicator of poverty. Near the high school’s locker bay, acceptance letters from each of DEPSA’s first three graduating classes are proudly displayed. Each class had a 100 percent college acceptance rate, and 82 percent of DEPSA’s first graduating class, now college seniors, are still enrolled and on track to graduate. As high school seniors, all students take a college seminar course where they learn about filling out admissions and financial aid applications. Each student is also assigned an alumni advisor who they can reach out to with questions or concerns during college. Asha came to DEPSA in the second grade form another Detroit Public School that has since closed. She said that it’s been her home ever since, “My friends at other schools don’t feel that way about their schools,” she said. DEPSA began as a part of the Edison Project, a for-profit entity where part of the school model meant returning any of the year’s leftover funds to the parent company. In 2010, DEPSA’s board decided to transition to a nonprofit model, believing the move would benefit students. Bland became the CEO of New Paradigm for Education, the nonprofit management company that now runs DEPSA and five other public charters in Detroit. The autonomy that comes with being a public charter school has contributed to DEPSA’s success. Kim Motley Bland, chief academic officer for New Paradigm for Education, said that having a CMO — rather than a central office — run the schools makes a big difference. Basing decision off students’ needs has led to many innovative, student-centered programs. The goal is for all students to enter third grade reading at or above grade level. DEPSA also offers special classes in its clinic for students who have health needs. For students who have asthma and diabetes, for example, the clinic has courses that teach students how to manage their condition. It also holds nutrition and weight management courses for students who struggle with obesity. In addition to AP classes and dual enrollment opportunities, DEPSA is the only school in Detroit with a sixth-through-12th grade full I.B. program. The Michigan Department of Education ranks the school in the 87th percentile for the state (based on the MDE accountability system), making it the highest-ranked school in Detroit. 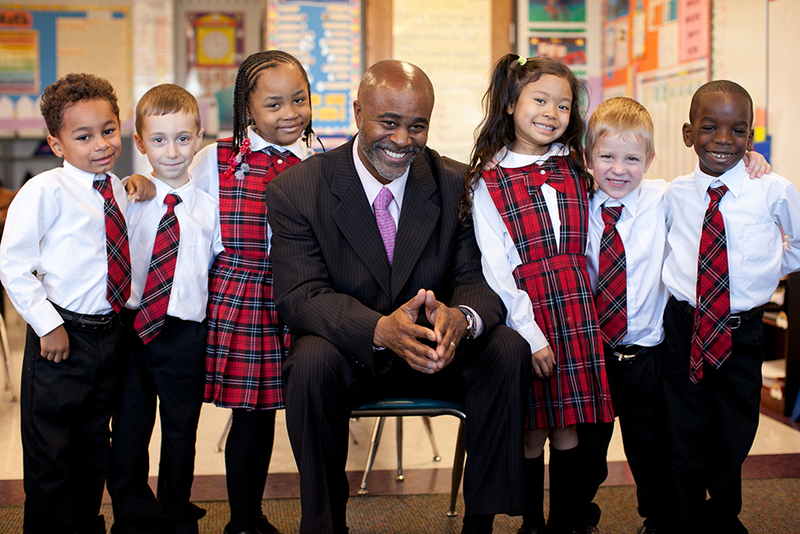 Not the highest-ranked public charter school; the highest-ranked school in Detroit, period. In a state notorious for weak charter schools, DEPSA stands out as an exemplar of what public schools could be if the state held its authorizers accountable for school success. Michigan has 14 charter school authorizers who are held accountable only to parents. The result has been that authorizers allow weak operators to open schools and then let failing schools continue to operate, rather than replace them with stronger operators. Weak authorizing is not only harmful to the students in those failing schools, but also to public school students in general. Having an abundance of weak charter schools in the sector creates difficulties for strong operators who are trying to grow their networks. Despite this challenge, New Paradigm Education, which currently serves about 2,400 students, will continue to grow. It recently received a 5 million dollar grant from the U.S. Department of Education. With these funds, New Paradigm hopes to establish a cluster of schools of the same quality and grow enrollment significantly. That’s good news for Detroit Public Schools parents because DEPSA is in demand. Like many high-performing charter schools across the county, DEPSA has a waitlist and must rely on a lottery for selection. As I got into my Uber to leave DEPSA, my driver began waving to school’s secretary. He told me that his son went to DEPSA. He told me how happy he was with the school. The school challenges his son, the teachers set high standards, and the staff knows him and keeps him involved in decisions about his son’s education. Throughout my visit, and during our ride, I was left with one thought: This is what public charter schools in Detroit could be. Detroit needs to find ways to hold their authorizers accountable for the success and failure of public charter schools. Replication of high-performing schools should be a priority. It’s time to put politics aside and put kids first. Every kid deserves the option to attend a school like DEPSA, and right now, Detroit, and many of America’s other cities, don’t have enough of them to go around. Emily Langhorne is an education project manager and policy analyst at the Progressive Policy Institute.